Seeds of Hope Village Foundation(SHVF) is pleased to announce it is now registered as a non-government organization(NGO) with the Belizean government. Belize is an English speaking Central American country located on the Caribbean coast of Northern America. It has a diverse population of approximately 380,000, the majority of which is made up of Creole(African-European), Mestizos(Hispanic-Amerindian), Maya(Yucatec and Mopan), Garifuna(African-Amerindian), and others. According to the United Nations Development Program in Belize, in 2016 the poverty rate was 41.3%, and slightly over half of the country’s population lives in rural areas. In July, Seeds of Hope Village Foundation’s (SHVF) Founder and Executive Director, Madeleine Jeune and 2 student volunteers Yasmeen Wirth and Lella Wirth traveled to Placencia, Belize. They flew out of Boston Logan International Airport into Miami International Airport, then boarded a connecting flight to Phillip S. W. Goldson International Airport, in Belize city, from there they took a Maya Island Air single-engine 12 seater Cessna Caravan into Placencia. They arrived with 6 large tightly packed suitcases, 3 carry-on suitcases, and 3 backpacks, all filled with tools, school supplies, and medical equipment. After resting for a day, Ms. Jeune and the 2 volunteers left Placencia for the Toledo District of Belize. They arrived at Medina Bank Village around noon to familiar smiling faces, and a delicious lunch of soup with freshly made corn tortillas. After lunch, accompanied by a few locals, they walked across a field and up a small hill, where a large and small school building sat. The smaller building had evidence of having been worked on, while the larger one was clearly in a state of complete disrepair both outside and inside. After much inquiry and discussion, SHVF was appointed proprietor of the larger building which is the primary school. Later that day, and at a pre-scheduled meeting with the local village representatives (a form of local government which exist in the Kekchi and Mopan Maya villages in Belize), Ms. Jeune met with the village council chairman, school PTA representative, government health worker, and the Alcalde(Mayor/police). During the meeting, plans for the school building and health fairs were presented and discussed, and resolutions were adopted. Once the plans were approved by the village council, SHVF was allowed to proceed with its programs and work. In a place with few cell phones and no electricity, communication and organizing can be a challenge. In a village of about 100 families, formal announcements are still made door to door by the Alcalde and others. 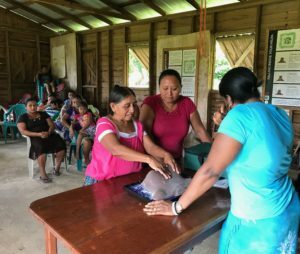 The Alcaldes were instrumental in getting the word out to the village women about the health class, focusing on breast cancer. In attendance were young and older woman, and some were accompanied by their small children. Using an open question and answer platform a discussion was held, during which a realistic breast prototype was used to teach the woman how to perform an effective self breast exam. For many of the women, this was their first time participating in such a class, at first, some were shy and apprehensive. However, as the class progressed the women became excited, silly, and engaging. By the end of class they were initiating conversations amongst themselves, and expressing interest in other health topics to me. In the following days, local volunteers were gathered and supplies were purchased, in preparation for work on the school. A couple of days were spent removing furnishings, and meticulously power washing the exterior and interior of the school. Once dried and prepped, priming and painting began. 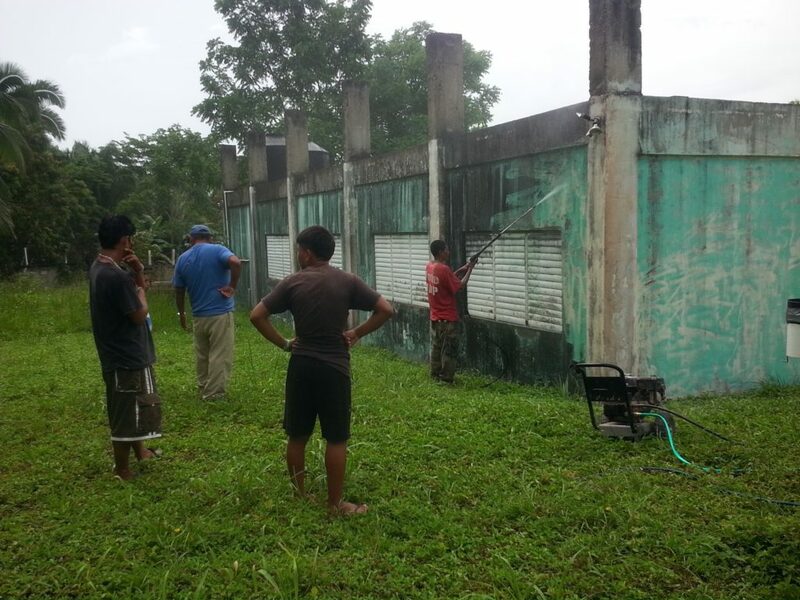 Due to the rainy season, our work was often interrupted and delayed by thunderstorms and rain. Some other unforeseen challenges of working in such a rural area, where the difficulty we faced in finding enough materials to complete the project in a timely manner. Long distances were traveled by car and boats, and countless hours were spent searching for paint, and other materials. While much progress was made on the building during our time there, it became very clear more than a of couple weeks were needed to complete such a large project, to be continued. 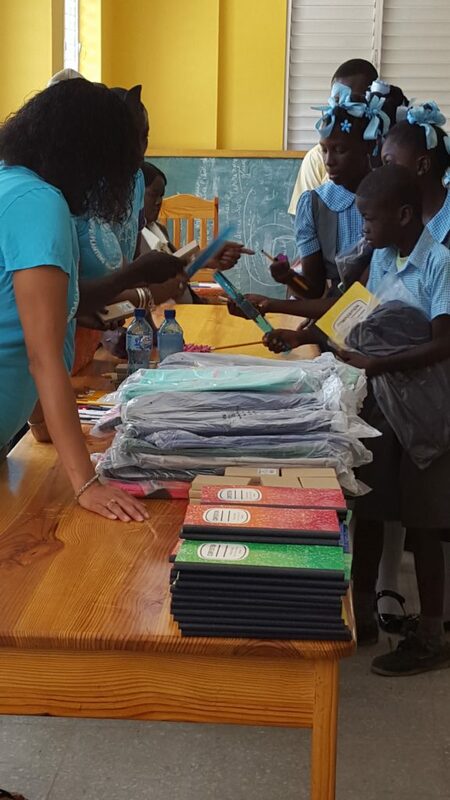 In between our work, we distributed school supplies to the Mayan children in Medina Bank Village, and to the Garifuna students at St. Alphonsus school in Seine Bight. A huge thanks to all of the Medina Bank residents who pitched in and helped out with the work, they were so accommodating to the SHVF volunteers. This was a very productive service trip much progress was made and a lot was accomplished. Seeds of Hope Village Foundation (SHVF) has been working on some massive undertakings over the course of the past year. After a very long uphill battle and countless hours of international phone calls and travel, SHVF is pleased to announce it is now officially registered as a non-government organization (NGO) with the Haitian government. SHVF was also designated as a 501(c)3 tax-exempt organization by the IRS in January 2017! According to the 2014 United Nations Development Program, the poverty rate in Haiti was 58.6% with those living in abject poverty at 24.7%, roughly ¼ of the population. Presently, Haiti’s literacy rate is 61.1% and 1 in 5 children suffer from hunger and malnutrition. Earlier this year, our Founder and Executive Director Madeleine Jeune, and our Community Health Advisor, Jean Brodnax, traveled to the northern part of Haiti on a service trip. 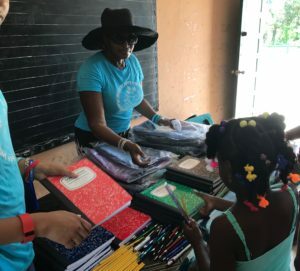 They flew into Cap-Haitian with 9 suitcases, 3 backpacks, and 3 carry-ons, all tightly packed with school supplies, medical supplies, and clothes. After navigating their way through the crowded streets of pedestrians, merchants, motorcycles, and cars, they finally made it to their destination. They arrived to children playing in the street, music blasting, and lots of curious onlookers. Early the next day, the crew headed to the Cap-Haitian open-air marketplace, where they purchased all of the food for distribution. The food and educational assistance SHVF provides to families are an important and essential part of our community outreach. On this past service trip, we worked with Ecole Saint-Joseph where 200 students received school supplies, and 250 families received food assistance. While SHVF is passionate about assisting those in need, we are also committed to addressing the fundamental issues of poverty, through education, training, and employment. These programs create short and long term employment for the locals. 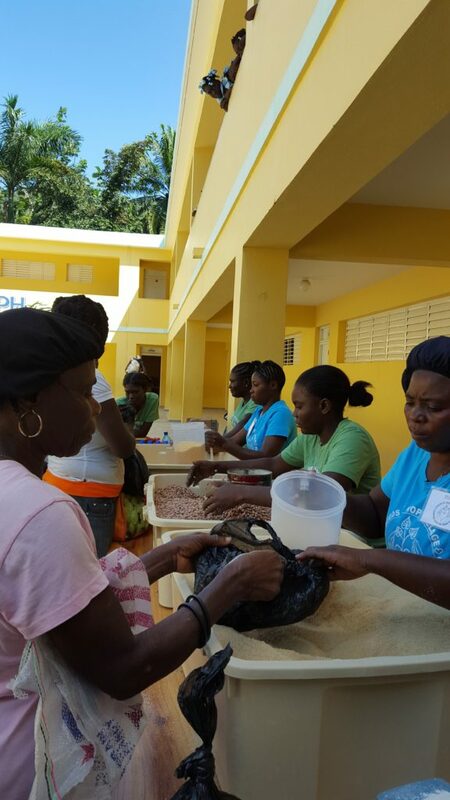 Our spring program in Haiti created about 20 temporary jobs, and SHVF currently has 3 permanent employees. Copyright © Seeds of Hope Village. All rights reserved.